Coaches, one of the biggest challenges we find is trying to track down scores the night of games. Many are posted on social media, sent directly to us, or entered by media partners, but there are still many that are not found until the following day, or perhaps not at all. We strongly encourage coaches to enter full stats information as soon as possible after each game, but sometimes playing on the road or the time of night make that not feasible. However, we certainly appreciate if you can at least enter your final score as soon as possible after the game. A quick and easy way to enter your final score is to use the SportsEngine mobile app for iOS and Android devices. In just a couple clicks, you can enter the final score as soon as possible after the game and come back later in the day or the following day to enter the full box score. We'll walk through the steps below to enter the final score in the SportsEngine mobile app. Please note that this will work for any sports covered on WSN. 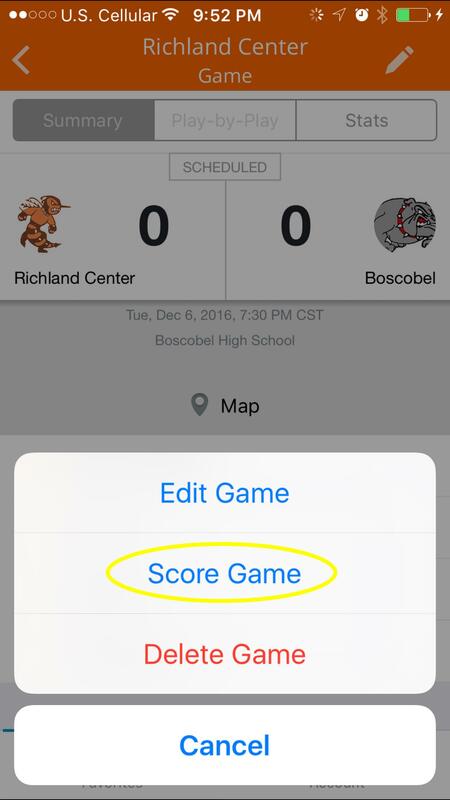 To enter scores or any stats information, you must first have access to your team on WisSports.net. If you already have an account with access, you're good to go. If you do not have an account with access, you must contact us at info@wissports.net to request access to your team. Please include your team name, sport, and your username. If you do not have an account yet, you will need to create a free account by clicking on the Create Account option in the top left. You'll need to login to our site and then click on the red Connect to this Site option in the top left of the page, and link your account to our site. Then contact us to request access. 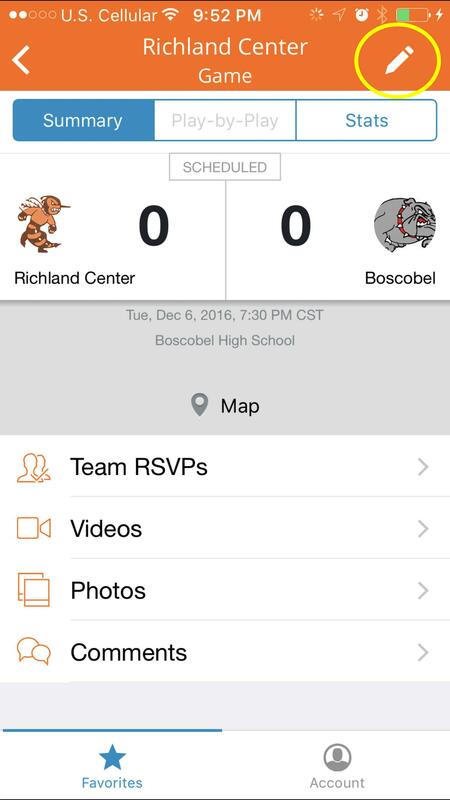 After download, login to the app with the same account you use on WisSports.net that has access to your team. Then, in the mobile app, search for your team and add it to your Favorites. Once a team is added to your favorites on the SportsEngine mobile app, you can navigate to the team schedule and then click on the game you'd like to enter the score for. If you have the appropriate access and are logged in to the correct account, when on the game page of the mobile app you will see a pencil icon in the top right of the screen as shown below. Click on that to edit. After clicking on the pencil/edit icon, a menu will come up where you should select "Score Game". See highlighted area below. You will now be able to enter the game score for both teams. After entering the score for both teams, be sure to change from In Progress to Final as shown below. Then click on Save in the upper right. 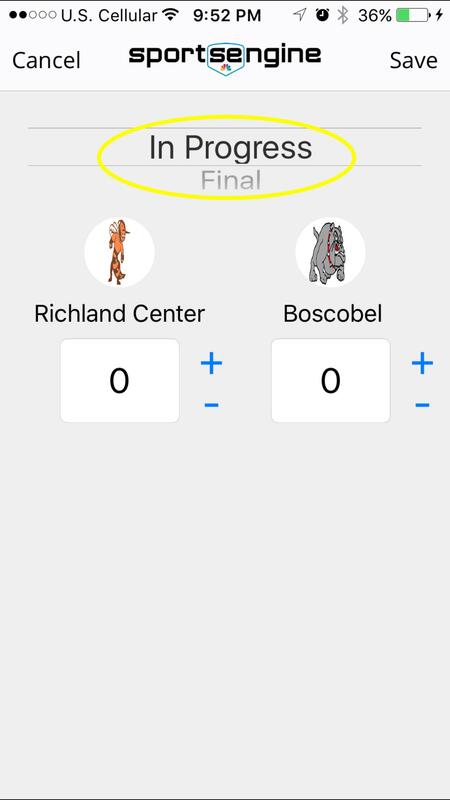 You're done, and the final score has now been entered on WisSports.net, and you can come back later as time allows to enter the full box score.